On March 14, thousands of students all across America staged a 17-minute walkout – one minute for every victim of the Valentine’s Day massacre in Marjory Stoneman Douglas High School in Parkland, Florida. The same day, the House passed the narrowly focused STOP School Violence Act of 2018 (H.R. 4909). NEA urged Congress to take additional common-sense steps to end the uniquely American epidemic of gun violenceand keep dangerous weapons out of dangerous hands. Educators overwhelmingly reject proposals to arm teachers and other school personnel, according to a nationwide survey commissioned by NEA that was released this week. “The idea of arming teachers is ill-conceived, preposterous, and dangerous. This new national survey of educators confirms that. Arming teachers and other school personnel does nothing to prevent gun violence. 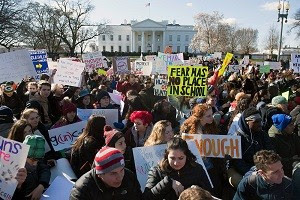 In fact, quite the contrary, educators would feel less safe if school personnel were armed,” said NEA President Lily Eskelsen García. Once again, it’s down to the wire. To keep the government running, Congress must complete work on the FY2018 budget by this Friday or pass yet another continuing resolution. We need to keep advocating for more education dollars, including significant increases in Title I, Title II, the Individuals with Disabilities Education Act (IDEA), and other programs that target the students most in need. Click on the take action button and urge Congress to invest in education. The Senate version of the IDEA Full Funding Act (S. 2542) was introduced this week. This bill would increase the federal contribution for the Individuals with Disabilities in Education Act (IDEA) gradually over ten years from 15 to 40 percent, the level of support Congress promised when it passed the original IDEA. It would also demonstrate that Congress is serious about meeting its commitment to helping school districts support all students. Click on the take action button and tell your senators and representative to co-sponsor and support the IDEA Full Funding Act.